Isoform LMP2A maintains EBV latent infection of B-lymphocyte, by preventing lytic reactivation of the virus in response to surface immunoglobulin (sIg) cross-linking. 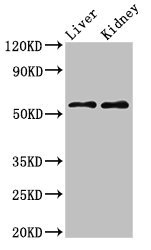 Acts like a dominant negative inhibitor of the sIg-associated protein tyrosine kinases, LYN and SYK. Also blocks translocation of the B-cell antigen receptor (BCR) into lipid rafts, preventing the subsequent signaling and accelerated internalization of the BCR upon BCR cross-linking. Serves as a molecular scaffold to recruit SYK, LYN and E3 protein-ubiquitin ligases, such as ITCH and NEDD4L, leading to ubiquitination and potential degradation of both tyrosines kinases. Possesses a constitutive signaling activity in non-transformed cells, inducing bypass of normal B lymphocyte developmental checkpoints allowing immunoglobulin-negative cells to colonize peripheral lymphoid organs.